Insect resistance to pesticides is measured several ways. Technical resistance is measured based on the LD50 (dose at which 50% of the population is killed). This can occur when field rates are still reasonably effective but is a sign of growing break down in efficacy. Growers are often more interested in mortality when a field rate is applied. Based on 2016 data from Dr. Thomas Unruh at USDA Wapato, the following is a summary of mortality of a range of products: Nexter and Delegate show no evidence of resistance or tolerance. Agrimek and Admire are showing moderate efficacy but some sites show modest resistance to these two materials. Psylla at all sites show extreme resistance to Pounce and Warrior. Percent mortality of psylla at the field rate of sample pesticides. Each bar represents an individual population of psylla. Data T. Unruh 2016, USDA-ARS. Miticide resistance ratios. RR = LC50 (R)/LC50(S). Individual populations collected from: C=Chelan County, Y=Yakima County, D =Douglas County, O=Okanogan County. E. Beers, WSU 2016. In 2014 and 2015 Dr. Betsy Beers, Washington State University, screened mite adulticides and ovicides for resistance. Using a resistance ratio that compares the lethal concentration for 50% of the population compared to what it would be for a susceptible population they predict a resistance ratio (RR=LC50 (R)/ LC50 (S). In general, a resistance ratio (RR) <3 = no resistance, RR 3-7 = transitional, and RR > 7 = resistant (Flexner 1988). 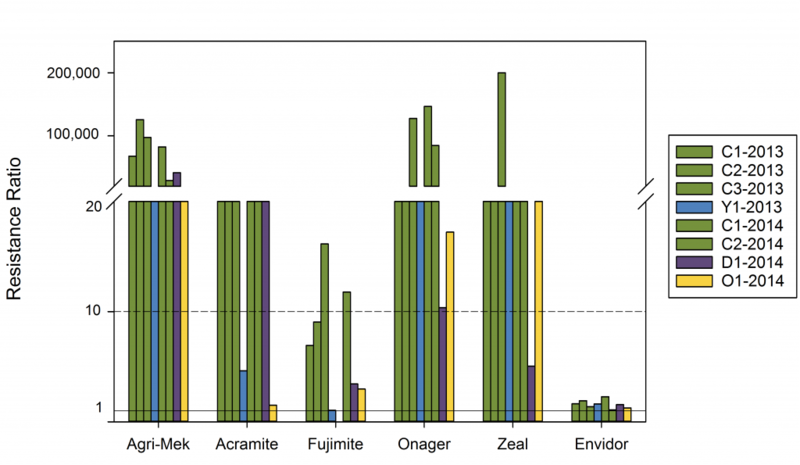 Agri-Mek, Acramite, Onager and Zeal had resistance ratios where most populations were over 10, considered resistant. In some populations the lethal concentration was 10,000 times higher than that of the susceptible population. High resistance ratios translates to low predicted mortality in the field. Mite populations collected from Chelan county varied from 2 to 22% mortality for Agri-Mek and 10-45% for Acramite adulticides. Ovicides were more highly variable with no mortality predicted in some populations and 100% in others for Onager and Zeal. This will put increasing pressure on the two materials Fujimite and Zeal which are working well. Miticides – Predicted % mortality at the field rate (adulticides). E. Beers, 2016. Miticides – Predicted % mortality at the field rate (ovicides). E. Beers, 2017. Water sprouts provide succulent leaves for psylla in June and July. Because water sprouts provide one of the only sources of succulent leaves at this time of the year, water sprout removal technique can help reduce the psylla population (Hodkinson 2009). Historically, growers had crews remove water sprouts in late June and early July. This technique can eliminate a large portion of the psylla population. With increasing pressure on labor it is more difficult to employ this management. Psylla reproduction tends to be higher in high nitrogen tissue. For example, Daugherty (2007) found 60% more nymphs and eggs on high nitrogen vs low nitrogen treatments. However, nitrogen management is more difficult to predict in large trees because a significant portion is cycled in the plant tissue.